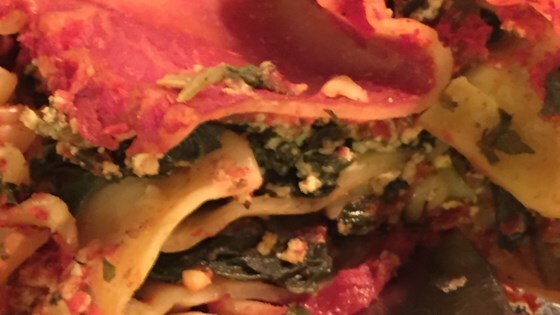 "Vegan version of an old favorite, easy to modify for manicotti, stuffed shells or with more, less or different veggies. If you'd like some vegan cheese, top the lasagna with soy cheese before baking. Soft tofu yields wetter lasagna; use firm tofu for drier lasagna." In a large skillet, saute garlic and mushrooms in oil until all the liquid is cooked out. Add 1/3 tomato puree to mushrooms and garlic, cook 2 to 3 minutes, and remove from heat. In a microwave-safe bowl, combine spinach, garlic salt, Italian seasoning and tofu. Blend until the mixture is an even consistency. Heat in a microwave on high for 2 minutes. In a 9x9 inch baking pan, pour one thin layer of remaining tomato puree, a layer of noodles, 1/2 the tofu mixture, the mushroom sauce, a layer of noodles, 1/2 the tofu mixture, a layer of tomato puree, a layer of noodles, and a final layer of tomato puree. Bake 45 minutes in the preheated oven. I tend to love vegetarian food. This was just awful. I mean, HORRIBLE. No flavor, no taste. Texture was awful. My husband actually spit his into the sink. Horrible. This was a great base of a recipe, but it is NOT truly vegan unless you use egg-free pasta. Instead, try layering sauted vegetables between the tofu. I haven't tried this recipe yet but a nice alternative to noodles zuccini sliced longways. Just remember it makes the lasagna a little more wet so you may want to use a firmer tofu. Very light lasagna. Great taste.